Gender Studies Students and faculty express their studies with Gender Studies in Hungary. University of Gothenburg, 17 October 2018. Staff and students express their solidarity with Gender Studies in Hungary and globally. University of Gothenburg, 25th October 2018. In the past two years the Hungarian Government has made a series of moves to limit academic freedom and reduce the impact of the civil society that opposes official government policies. This series of attacks culminated in a ban on Gender Studies in early October. The ban was followed by a statement issued by the spokesman of the Prime Minister reaffirming that ‘The government’s standpoint is that people are born either male or female, and we do not consider it acceptable for us to talk about socially constructed genders rather than biological sexes’. According to Andrea Pető, professor at the Gender Studies Department at the Central European University, the Hungarian government not only revoked the Hungarian accredited two-year M.A. program by erasing it from line 15 of the document, but also substituted Gender Studies with a new study program: ‘Economics of Family Policy and Public Policies for Human Development’. The government’s efforts to limit academic freedom culminated with a recent announcement made by CEU that it will be moving to Vienna, in the academic year 2019/2020, as the government has not concluded an agreement that would allow CEU to operate in freedom in Hungary. We do not see the events in Hungary as isolated, but rather as part of a larger network of attacks on Gender Studies in Europe, the USA, Latin America and the Middle East. These attacks come in different forms, at the individual, institutional and political levels. It may manifest as physical violence and threats or legal and political reforms. The decision to ban gender studies should be addressed as one specific manifestation of a broader anti-gender movement that has made critical research, academic freedom and knowledge production its targets. As part of a research field of prolific debates on knowledge production, we are well aware that all forms of academic work stand in close relation to politics. This urges us to acknowledge the specific political interests that the ban on gender studies in Hungary serves, but also to stress that this is but one of the violent effects of these movements. 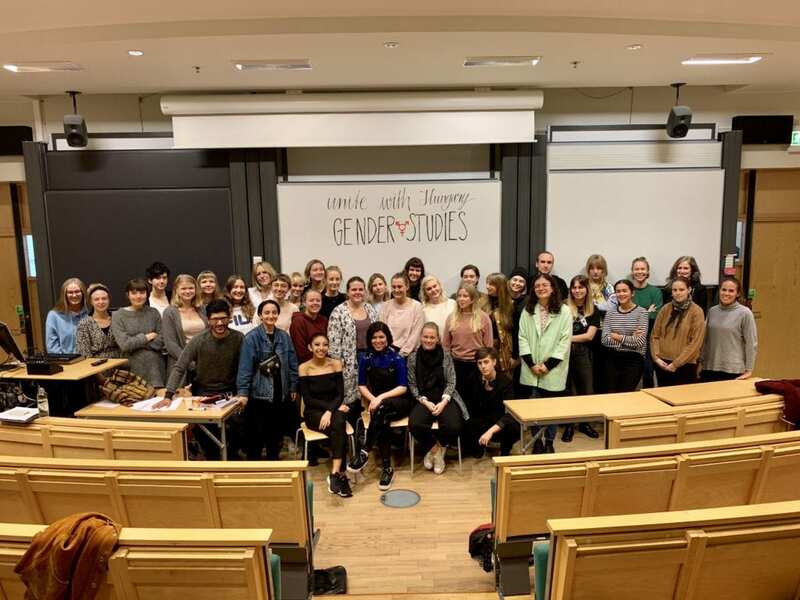 Therefore, as a response to these attacks, globally and locally, an initiative was formed by university teachers and students at the University of Gothenburg and a call for mobilisation was issued with a goal to express solidarity with Gender Studies. The initiative started in the Summer of this year when in August our first statement of support was issued and sent to the Hungarian minister of Education. Building upon our engagement with participatory approaches students from the first year Course in Gender Studies at the Department of Cultural Sciences, Gothenburg University designed a slogan and sent out their support widely. This idea was followed by staff members to make a call for a university-wide action. 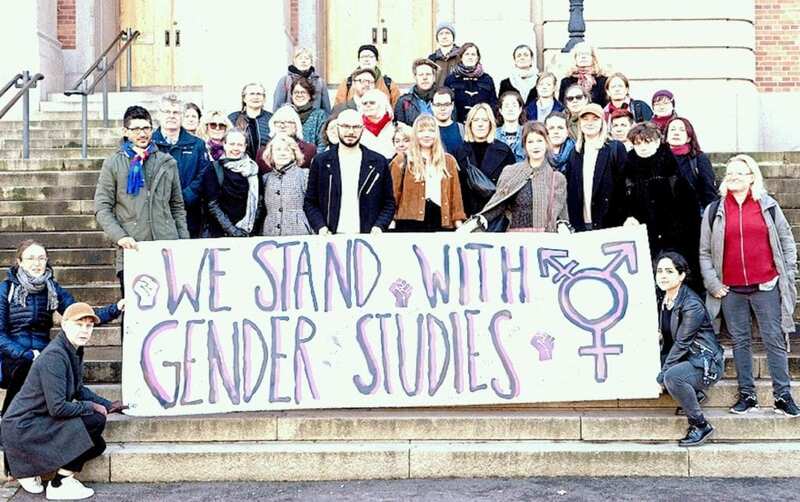 This resulted in a gathering on October 25, 2018, when a group of around 40 university representatives, deans, teachers, students, and activists gathered in front of the main university building in Gothenburg, to express solidarity with Hungarian Gender Studies teachers and students and condemn attacks on Gender Studies globally. We, the undersigned, are concerned that this is just the inception of a growing phenomenon of anti-Gender Studies sentiment. With this act of solidarity, we would like to state definitively that such action will be met with strong resistance and that Gender Studies as a scientific field of research will persist and thrive despite efforts to shut it down. We strongly condemn the acts of the Hungarian Government and express our solidarity with Gender Studies scholars worldwide. Arman Heljic, PhD student in Gender Studies, Department of Cultural Sciences, Gothenburg University. Tobias Pontara, Associate Professor in Musicology, Department of Cultural Sciences, Gothenburg University. Helena Holgersson, Senior Lecturer in Cultural Studies, Department of Cultural Sciences, Gothenburg. Alf Björnberg, Professor in Musicology, Department of Cultural Sciences, University of Gothenburg. Erika Alm, Assistant Professor in Gender Studies, Department of Cultural Sciences, Gothenburg. Valeria Villegas Lindvall, PhD student in Film Studies. Department of Cultural Sciences, Gothenburg. Rebecca Harrison. Lecturer in Film and Television Studies, University of Glasgow (UK). Dr Sophie Knowles, Senior Lecturer in Journalism, Middlesex University, UK. Susan Sayce, Senior Lecturer in HR University of East Anglia, (UK). Michael Muller, ACM Distinguished Scientist and member, ACM SIGCHI Academy. Catherine Baker, PhD candidate in Media and Communications, Loughborough University, Loughborough, UK. Kathi Kamleitner, PhD candidate in Film and Television Studies, University of Glasgow, UK. Juan Velásquez Atehortúa, Associate professor in Gender Studies, Department of Cultural Sciences, University of Gothenburg. Alessio Koliulis, Teaching Assistant, Development Planning Unit, UCL, London. Dr Maria Brock, Research Associate, School of Journalism, Media and Culture, Cardiff University. Maria Sulimma, Post Doc in American Studies, University of Duisburg-Essen, Germany. Dr Ruth Pearce, Research Fellow, School of Sociology and Social Policy, University of Leeds, UK. Mercedes Vázquez Vázquez, PhD, Lecturer & Honorary Assistant Professor, The University of Hong Kong. Dr Leora Hadas, Teaching Associate, Department of Culture, Film and Media, School of Cultures, Languages and Area Studies, University of Nottingham. Dr Reva Yunus, PhD Sociology, University of Warwick, UK; Assitant Professor, School of Liberal Studies, Azim Premji University, India. Professor Lynne Segal, Birkbeck University of London. Houman Sadri, PhD Candidate and lecturer, University of Gothenburg, Sweden.